By “Big Buts” I’m referring to paragraphs that start with the word “But.” It turns out the New York Times is very fond of them. We followed the front pages of 5 newspapers for 21 days this month. 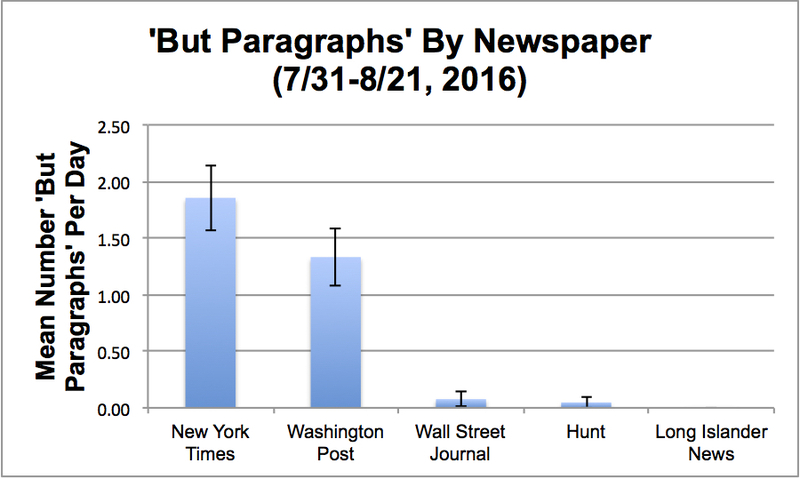 The New York Times averaged nearly 2 “But Paragraphs” per day (or “BP’s”). In contrast, the Wall Street Journal and two small local newspapers had virtually zero BP’s. Why is this? The data are cut and dried. Pick up the New York Times on any given day (as we did for 21 days) and you will see upwards of 4 stories that have a paragraph which starts with the word “But.” It’s usually the third or fourth paragraph of the story. It’s as simple as ABT — our “And, But, Therefore” template — or more specifically just the AB elements. The front page of the New York Times, being so widely read, reaching for the broadest audience, having earned the most Pulitzer Prizes, and having the strongest narrative voice in the world of newspapers, also is the strongest “selective regime” for narrative structure. “Should a Sentence Ever Start With ‘And’? Another pet peeve of some commenters is the use of “but” or “and” to begin a sentence. I don’t see any basis for their objections. Journalists seem to shrug and chuckle at everything I mention about the ABT. Most act like they already know all this — they learned it in grade school. But they didn’t. The ABT is the DNA of story. It comes from Hollywood. It is both new (never before formalized) and old (the same thing as the age old elements of narrative form, going back to the Greeks, it’s just a new, more concise statement of them). It’s at the core of our Story Circles Narrative Training that is now going wide. The ABT opens up a whole new world of text analysis, as we’re deep into now. There will be lots more coming along these lines in the next few months. All new. Which means, no, you didn’t already know this. Big thanks to Daria Epakchi for data gathering and Steph Yin for the NY Times editing insights.